Grilling fresh haddock brings out its natural flavor without adding fat, but it can be a frustrating endeavor. Grilled haddock fillets have a delicate texture and too often end up breaking apart and slipping through the grilling rack, no matter how carefully you try to prevent this. Fortunately, there is a very simple solution. The best way to ensure that you don’t lose any tasty fish when you grill haddock fillets is to use a grilling container. 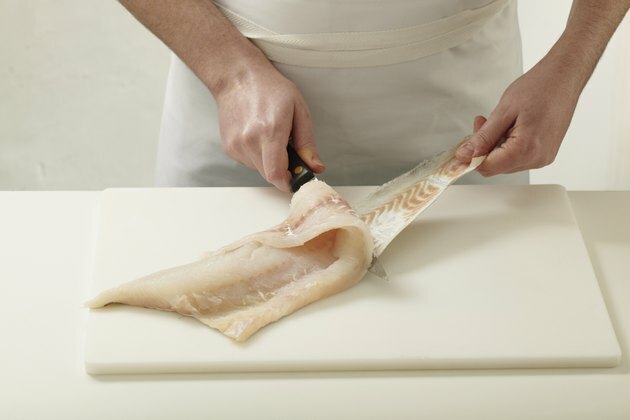 Rinse your haddock fillets carefully under lightly running water, and pat them dry with paper towels. Handle haddock very carefully, because it has a tendency to fall apart. Pour ¼ cup of olive oil into a shallow dish or onto a plate, and add whatever spices you prefer. Coat both sides of the haddock fillets with the seasoned oil, being careful not to break them apart as you work with them. Spray the inside of your grilling container with nonstick cooking spray so that the haddock won’t stick while it is grilling. Place the seasoned haddock fillets inside the grilling container and close it securely. Set the grilling container on the grill over medium high heat and cook the haddock for 5 to 7 minutes per side. The fillets are done when they are opaque all the way through and flake easily. Wrap haddock fillets in aluminum foil and poke the foil full of holes if you don’t have a grilling container. Never set cooked fish on the same plate that held raw fish to avoid contamination. What Are the Health Benefits of Swordfish?